The Tuscan white truffle (Tuber magnatum pico) has a smooth pale yellow or green outer skin, and a more or less light hazel-brown pulp that sometimes presents bright red shades, and has numerous thin pale lines running through it, which disappear when cooked. The size can vary from that of a corn seed to, at most, that of an orange. The aroma is intense and pleasant, similar to that of natural gas or fermented cheese. Truffles can be found in areas in the north-west region of the Apennine mountains and a vast central strip that extends from lower Valdarno (Pisa, Pontedera) to the borders of Lazio (San Casciano dei Bagni). Tuscan white truffle of Crete Senese. 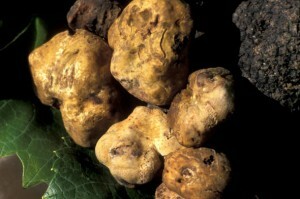 Regional regulations establish that truffles can be picked only from September 19 to December 31. The white truffle can be picked both on large strips of land between the hills (marked by pronounced dry spells in summer), along water banks, in shady valleys, in humid terrains at the bottom of valleys, on hills looking north – preferably near poplar, willow, hazel, and English oak woods – as well as in predominantly humid Apennine areas, in mixed caducous broad-leaf forests, on the edges of meadows or pastures near Adriatic oak, and hornbeam woods etc woods. Truffles are picked using specially trained dogs and a special tool: the “vanghetto”, a small hoe with a short think handle of variable shape and size. Truffles are preserved in refrigerators in closed containers. Mugello also offers mushroom lovers different, less renowned species such as the bianchetto (Tuber Borchii Vitt. ), the scorzone (Tuber aestivum Vitt. ), the uncinato (Tuber uncinatum Chatin) and the brumale (Tuber brumale Vitt.). In rare occasions the excellent black truffle(Tuber melanosporum Vitt.) has also been found.